I’m always one for being last minute with things! It’s a bad habit that I have yet to break. So, if you’re like me, you just realized that Father’s Day is just two days away and you still need a gift. Yikes! My husband really doesn’t like me to go out and get him things. If needs something or wants something, he generally talks to me about it and then gets it. Case in point, last month he got some fun new power tools that he’s been using around the house. That was his Father’s Day, birthday, and Christmas (he stocked up!). However, I still like to have something for him. He likes getting meaningful notes and artwork from the kids so this little poem/printable is perfect. 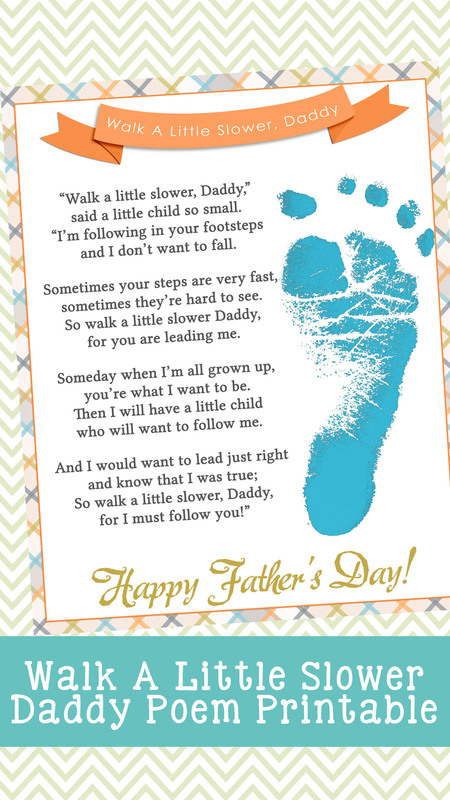 The poem is called “Walk A Little Slower Daddy” and is perfect for Father’s Day. I already have a frame for it and just need to grab my kiddos and add their footprints! If anything, it’s a keepsake I’d like for myself too. When they’re older, I know I’ll love looking back at their cute little feet, although they are definitely not as little as they used to be. I also included a page that has the print already on it if you run out of time or don’t want to deal with paint. Especially if you have a big group of kids! It makes a great gift to use in your Primary classes too. My sister-in-law is using it for their primary group at church. They are having the kids stamp their footprint on it and give it to their Father’s after church. All you have to do is print it! Be sure to bring a drop cloth for the kids to stand on while they are printing their footprint and wipes to clean off the paint. The kids will love making them too (we had several that giggled from the paintbrush tickling their feet). « World Cup For Kids!